Home > Holiday Deals > Toy Story 3 Operation: $1 at Toys R Us! Toy Story 3 Operation: $1 at Toys R Us! Update: These are sold out online in most regions, don’t forget that you can price match at Target and Walmart! Grab a fun Christmas present today for $1 at Toys R Us! 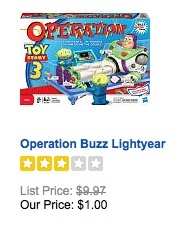 They have the Toy Story 3 version of Operation on sale for $1 (reg. $9.97). You can get this in stores or online. If you do shop online sign up for the trial of shopprunner to get FREE 2 day shipping for 30 days (perfect for holiday shopping).